This dissertation explores the evolution of operatic idioms, especially vocal typecasting conventions, in response to social change in the volatile late Russian Empire. It complements earlier composer-centered approaches to Russian opera with a focus on the contributions of a heretofore neglected group of historical agents: singers. 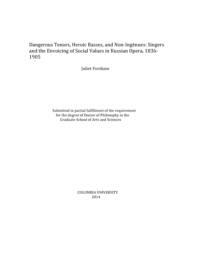 By examining the operas themselves as well as primary sources such as memoirs, letters, reviews, photographs, and early sound recordings, I trace the ways in which singers crystallized the Russian intelligentsia's evolving attitudes toward political and parental authority, gender roles, and political radicalism in memorable operatic characters. With four chapters devoted to the extraordinary bass, tenor, soprano, and mezzo stars who worked with composers to establish the stock characters and vocal conventions of this repertoire, I argue that art imitated life: these singers transmuted their own real-life experiences of Russian society into operatic portrayals that resonated with the controversies of their time. This dissertation thus provides a new angle on Russian opera's engagement with the political and social issues of the era leading up to the Revolution.